We’ve come to that time of the month when your Christmas gatherings and gift-exchanges are drawing near. You’ve had plenty of time to start looking around, but you’re running out of time to find the perfect gift. Getting beauty items might not be the safest choice as not everyone in your office or gang might wear makeup. You can’t go wrong with skincare sets as everyone (yes, including all you guys!) appreciates good skincare. THEFACESHOP has made things easier for us by putting together their bestsellers in nifty little gift sets that you can’t go wrong with. From travel sets to brand favourites, there’ll be something for everyone. They’ve even got all sorts of face masks sets, which are guaranteed to be a big hit amongst women of all ages. All the gift sets also come packaged in striking red, gold, and white boxes to match the festive colours of this season. Hand creams are like the socks of the beauty world when it comes to Christmas gifting. Everyone will somehow find a use for them, and they are pretty useful even if they might seem underwhelming as a present at first. Keep your hands constantly moisturised and soft, or you can even use them on as lotion replacements on really dry spots like your elbows or knees in extreme emergencies. 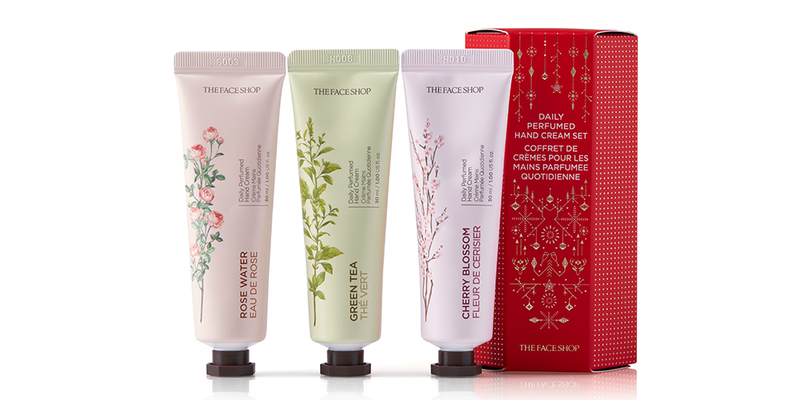 This year’s hand cream set comes in 3 different fragrances that most people love – Rose Water, Green Tea and Cherry Blossom. Got a friend or colleague who is constantly travelling? This trio of cleansing foams in portable squeeze bottles will definitely come in handy when packing for their trips. The Herb Day Cleansing Foam is formulated with a blend of 9 kinds of herbs to helps to remove both impurities and makeup to leave your face squeaky clean even when you’re in harsh and polluted environments. And the Herb Day cleansers are suitable for all skin types, so you only need a single bottle to share amongst your friends when travelling together! Rice water is a popular beauty cleansing ritual in Korea for centuries, and it takes the center stage in this holiday set. Rice water contains vitamin A, B and C, and ceramide, which helps to brighten and nourish dry skin. We recommend getting this for that friend who spends way too much time in the sun so that she can moisturise and brighten her skin! Rice water is very gentle on the skin, and this set comes with a Foaming Cleanser and Light Cleansing Oil, along with 4 hydrating face masks. 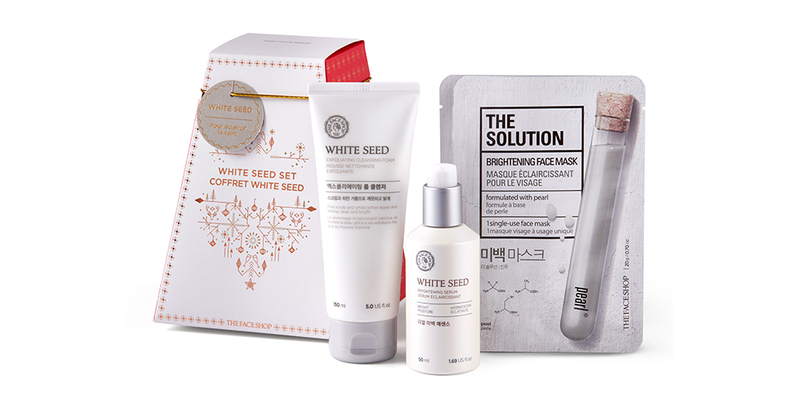 And for that person who has tried countless brightening treatments and still can’t find one that works: get them the Holiday Edition White Seed Set, which is a 3-step set designed to give your skin that flawless Korean glow. Bright skin also makes you look more awake so you won’t look as tired as you feel. 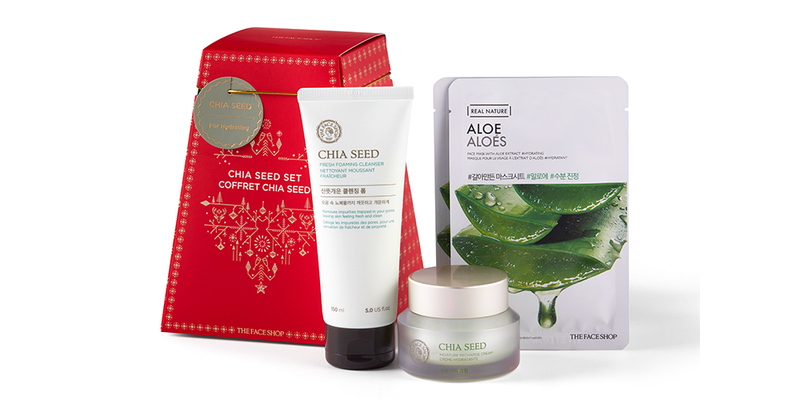 The White Seed Set comes with a Brightening Serum, Exfoliating Cleansing Foam, and 3 Solution Brightening Face Masks. If you’re not one for drinking chia seeds with your tea, you can still enjoy the benefits of the superfood with this cleansing range. The Chia Seed Moisture Recharge Cream and Fresh Foaming Cleanser contains chia seed extracts, proteins, and antioxidants to reinvigorate your skin. The Chia Seed range also has a light texture, which is suitable for use in our hot and humid climate! Finally the set also comes with two refreshing Aloe Face Masks for some relaxing me-time. Buying skincare sets might be tricky if you’re not sure of your friends’ skin types – you don’t want to get them something that they can’t use because it’s not suitable for them! You can play it safer by getting them a sheet mask set instead because everyone loves sheet masks as much as they love hand creams. Probably the most popular sheet mask range from THEFACESHOP, The Real Nature series caters to all kinds of skin concerns that you can think of: moisturising, soothing, brightening, firming… If you aren’t sure how your skin is going to react on your travels, pop a few of these sheets into your travelling kit. Whether you’re suffering from a sunburn or overly dry winter’s wind, all you have to do is slap on a mask for 20 minutes for some damage control before you head to bed. It’ll definitely speed up your skin’s recovery. You should use this chance to stock up on these Real Nature masks yourself as you get 5 free pieces for every 15 pieces you buy. We’ve harped on and on about the beauty benefits of the magical ingredient coconut, and here’s another mask range that uses extracts from the tropical fruit. The Biocell Mask series comes in four variations: Moisture, Brighten, Firming, and Recovery. Switch them up depending on what your skin needs! THEFACESHOP is also running a promotion where you get 4 pieces free when you buy 6 pieces. The best set to get for your colleague because The Solution range is suitable for all skin types covering all kinds of skin concerns. The 10 various skin concerns targeted are: hydrating, moisturising, brightening, radiance, firming, wrinkle care, nourishing, soothing, pore care, and smoothing. You’ve covered all the bases with this set. And you can even use this chance to try out the masks for yourself as every 15 pieces you buy, you’ll receive an additional 5 pieces for free. Noticed your skin sagging lately? You might want to check this mask range out. The Mask Lab series also has a lifting effect in addition to targeting the various major skin concerns so that you can get that V-shaped face without having to resort to Meitu. 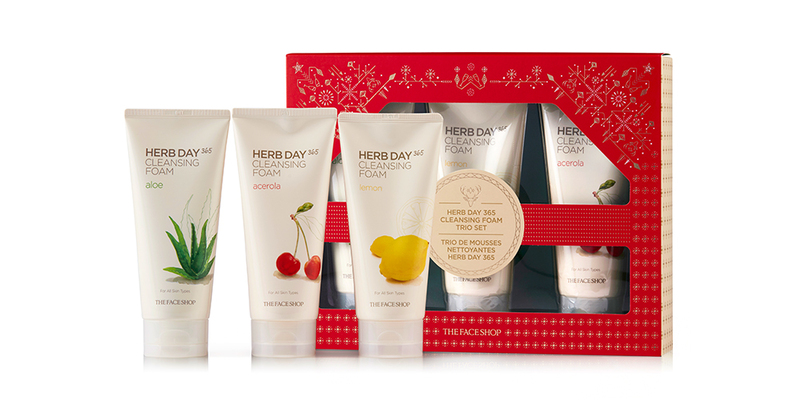 THEFACESHOP Holiday Edition Series is now available at all THEFACESHOP stores island-wide.